Now read on to discover the Charms of the Charente that you won’t want to miss, and details of how to claim your exclusive discount. Begin your visit with a Rampart Tour of the the capital of the Charente region, for spectacular views! The town has a vibrant culture with many festivals including a variety of musical ones, and activities for all ages. Each year, the Angoulême International Comics Festival takes place in January, but you and your children can enjoy the history of the Comic Strip in the excellent museum dedicated to this most appreciated form of literature among the young, whenever you cruise. See Tin-Tin! The Paper Museum is also excellent.. Discover the history of the paper industry established in the 16th century. Historians among you will enjoy the Medieval cathedral of Saint Pierre, built in the early 12th century in Roman, Byzantim style. PS Don’t miss the chocolate factory Letuffe at Trois-Palis, close to Angouleme, for an unforgettable tasting of fine and varied heavenly chocolates! Boasting a rich Gallo-roman, medieval and classical heritage, Saintes is one of the most popular tourist destinations in the Charente. Marvel at the Roman arch of Germanicus dating from 20AD, the enormous Gallo-Roman ampitheater, the Roman baths, the high ramparts and the magnificent Gothic cathedral and the Basilica Sainte Eutrope. The archeological museum displays a host of interesting artefacts such as jewels, earthenware and tools, including a horse-drawn wagon dating from the 1st century! Exquisite art works and porcelain from the 15th to 18th centuries can be seen in the Presidial museum. Despite it’s name, this is an ancient settlement. Proof of human occupation found in local caves dates from pre-historic times. The original château of Berdeville was burnt to the ground in 1081, and with the ‘new’ one came the change of name for this charming village. The resulting château is no longer, but it’s church of Saint Pierre , founded in the 17th century remains. Here you can see some of the finest Romanesque craftsmanship of the region. For those looking for something more modern, why not hop on your bikes to visit the vintage car collection at nearby St Simon? The château of St Brice, with it’s magnificent labyrinth of box trees,which are hundreds of years old, has a rather quirky addition: A life-size hunting scene in bronze beside the river! You can enjoy a round of golf here, or a relaxing evening at the Sound and Light show at the château. Although from the 11th to 16th century Cognac was an important salt-trading town, it is now world-famous for its smooth, brandy liquor production. Almost all the houses offer visits and tastings. On arrival in the town, the amber-coloured roof tiles bare the traces of ‘Angel’s Share’, a dark moss produced by the alcoholic vapours of the double-distillery process unique to Cognac production. To complete the picture, why not visit the the Saint Gobain glass and barrel making works? The Nicols base at Sireuil offers you a warm welcome. 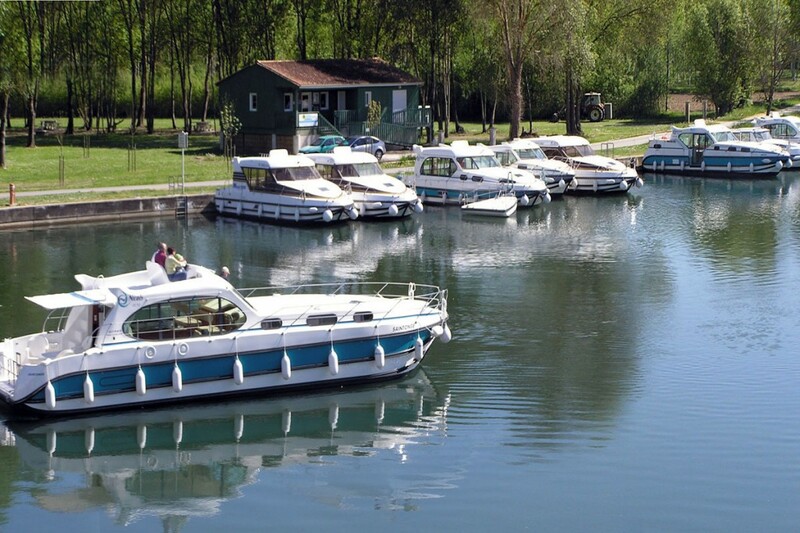 The Charente is the ideal destination for all. and save 5% on any one week cruise, all dates, in 2014. You won’t find this offer anywhere else! Contact us now quoting CHARENTE and let us help you find the perfect cruise for your ideal dates at the best price possible. This promotion is valid when confirming by February 28th 2014.